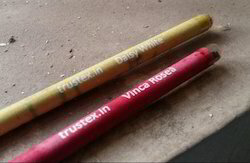 With long working years we are offering best and perfect quality array of Eco Friendly Pencil. These Pencil are designed and created by our professional with the use of modern machines, tools and expertise. They are quality assured. These Pencil are sleek in designs. They are affordable in rates. We are offering Recycled Paper Pencil to our clients. Pencil made from news paper.much durable than regular wood pencil.no joints so no breakage.centered lead so no breakage while sharpening.no breakage while writing. Made from recycled news paper.